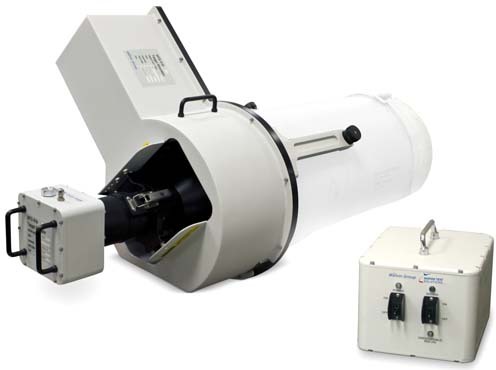 Comprehensive testing of optically–guided weapons requires a device, such as the MTS–916 Series Target Simulators from Marvin Test Solutions, to simulate either a stationary or moving target. Bodkin Design & Engineering recently custom–engineered a blackbody infrared radiance standard that Marvin Test Solutions integrates into its modular target simulators. Photo courtesy of Marvin Test Solutions and Bodkin Design & Engineering. NEWTON, Mass.–The complete testing of optically–guided weapons is a complex matter that requires a device to simulate either a stationary or moving target. Target simulation ensures that an optical seeker can track and terminally guide a weapon to the target, and it is a specialty of Marvin Test Solutions, a vertically integrated aerospace and test measurement company that makes test equipment in support of major defense aircraft and munitions around the world. Recently, Marvin Test Solutions commissioned Bodkin Design & Engineering to custom–engineer a blackbody infrared radiance standard to integrate into Marvin's modular target simulators. The OEM blackbody is designed for automated self–calibration of infrared systems. The blackbody unit supplied by Bodkin Design & Engineering is a derivative of Bodkin's MRDT–50 infrared calibrator product, originally developed to calibrate infrared tracking cameras at White Sands Missile Range. Marvin Test Solutions incorporates the device into its MTS–916 series of Modular Target Simulators. The MTS–916 is part of a suite of armament and munitions test products that support the testing and verification of optically–guided weapon systems, such as Maverick or Hellfire missiles. "Bodkin Design and Engineering is a valued supplier that we know we can depend on for OEM components and subassemblies that meet our most demanding requirements," said Lowell Parsons, director of test engineering for Marvin Test Solutions, in a press release. "Their focus on quality and customer support enables us to continue delivering the advanced mil/aero test solutions our customers need." Bodkin Design & Engineering (www.bodkindesign.com) has been providing electro–optic engineering and custom manufacturing, as well as test and R&D services, since 2003. The company serves the international OEM, commercial, military, and research communities and said that it has recently been working with MassMEP, a resource committed to manufacturing growth in the state of Massachusetts, to grow its OEM business profile. Last August, the company was awarded the first round of a $1.5 million SBIR Phase 2 contract from the U.S. Navy to develop a light source for night time, multi–spectral reconnaissance. The night time illuminator will be carried by the Northrop Grumman MQ–8 Firescout, an unmanned autonomous helicopter developed for the United States Armed Forces.